Recruitment notification published by Indian Navy for the post of Officer Short Service Commission in Executive Branch and Information technology in Education Branch. The course will be comisning in July 2018 at Indian Naval Academy (INA) Kerla. Recruitment criteria and other qualification is given as follow. Logistic Branch: 02 Jul 1993 to 01 Jan 1999 (SSC) Male and female candidates. Low Branch: 02 Jul 1991 to 01 Jul 1996 (SSC) Male and Female candidates. 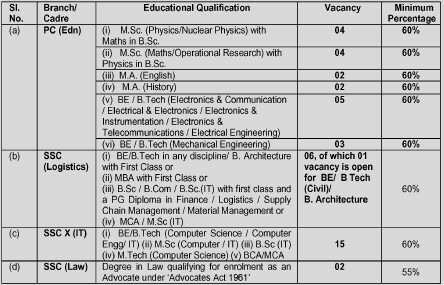 Information Technology: 02 Jul 1993 to 01 Jan 1999 (SSC) Male candidates only. Height and weight:- at lest minimum 157 cm for male candidates and 152 cm for female candidates. Eye sight:- Minimum vision standards is 6/60 in both eyes, correctable with eye to 6/6 in better eye & 6/12 in worst eye. Tatto: Body tattoo not allowed but some of the parts allowed with tattoo, like inner face of forearms, inside of elbow to wrist and on the reverse side of the palm side of the hand. Candidates are to register himself at official website. While applying online, you are advised to keep the documents ready. Mobile number and email address are mandatory field in the application form. Scanned copy of all documents are required in JPG/FIIT format. Print one copy of online application form. Carry original documents and copy of application form while appearing for SSB Interview.